Start in the lowest class and work your way up to find your level. 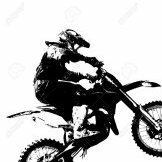 If you start in too high a class you might miss some of the basic skills that are the foundation of moto skills. When I park my Bultaco for a week or two I turn off the tap and run most of the fuel out of the float bowl, if the bike will be parked for a longer time I remove and drain the float bowl. Minimizing the time the float has to sit in the swill that passes for gasoline these days will help it live long and prosper. The float I used was from my 94 R100 GS and was identical to the original float. In the U.S. BMWs came with 32mm carbs, in other markets 40mm carbs were standard, I don't know if they use the same float so you might double check that. In the U.S. I've found BMW dealers to be a good, and the least expensive, source for Bing parts. Replace the float, it's the same one used in the 32mm Bings on BMW airheads and is available and inexpensive. I've been running a used BMW float for a few years but I think it might be time to buy a new one. I can't fault the logic that the best repair for a Bing is to replace it with a Mikuni though. I use that in my saws, other than the expense I would have no problem using it my bikes. Bel Ray makes Husky oil. Here's what I use. http://www.belray.com/bel-ray-mc-1-racing-full-synthetic-2t-engine-oil I've been using it since it was a new product. Snowmobiles had it a few years before that, since 97 if I remember correctly. Did your "carb clean" include removing every removable part and cleaning all passages? If not do it over. The 74/75 models had lighter flywheels, I ran one on my 77 model. I don't think it helped my scores but it made the bike more fun to ride. Get your bike in good working order before making any changes though. I suggest buying a Domino Trials throttle with a new cable, not expensive and will give you a fresh start. Get some Trials grips while you're at it. Last I checked Tublisss did not offer a system for 1.85 rim, has that changed? Feetupfun, if there's no photo of the modified rim can you post a sketch of what you did? I can't picture it. I was considering sealed caps to slow fork compression on hard drops where the fork bottoms out. I found that I could buy new springs for less than new caps, my springs appear to be original with added PVC spacers so I decided to go that route. I decided to try shortening my springs first. I cut 50mm off of one spring and added 45mm of PVC spacer in it's place with good result. My 199A fork still has good compliance on the small stuff and steers well but is a little more stable on steep, sudden, drops, where it still bottoms out. I may play with the other spring later but I'll ride it as it is for a while first. Have you ever experienced pressure build up beyond what you wanted, or do you have manual vents on your caps? I see Bultaco UK sells a pair with Schraeder valves. How did you seal the caps?